Charles R. Drew University President David Carlisle speaks with nursing students on the Los Angeles campus. Photo: Patrick T. Fallon. 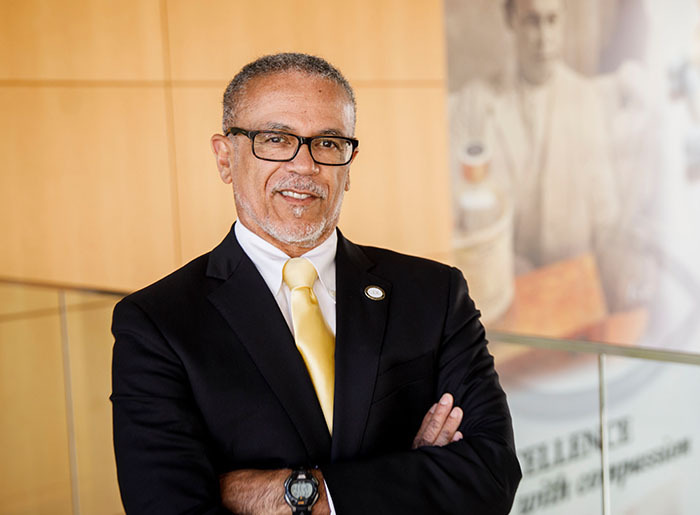 David M. Carlisle, MD, PhD, is President of Charles R. Drew University of Medicine and Science. This interview appeared on the California Health Care Foundation blog. The son of a career military man and an architect, Carlisle spent his childhood in Los Angeles not far from where CDU is now. Since the beginning of his higher education, Carlisle was acutely aware of the contributions of CDU. At Wesleyan University, he was drawn to scientific research and went on to medical school (starting at Stanford, then finishing at Brown). He got his MPH and PhD at UCLA and joined the faculty there. After 11 years as director of the California Office of State Health Planning and Development (OSHPD), he was named president of CDU. CDU President David Carlisle, who joined the CHCF Board of Directors in 2018, stands before a campus portrait of Charles R. Drew. Photo: Patrick T. Fallon. I spoke to Carlisle recently about his career and his commitment to build and diversify the health care workforce and to expand access to care in underserved areas of California. Our interview has been condensed and edited for clarity. Q: You’ve spent your entire career in the health care world. What propelled you down that path? A: My interest in medicine started when I was little and we were living in northern Virginia. I remember going to a primary care doctor in Alexandria and noticing the waiting room was jammed with poor Black patients who had no affordable alternatives. When I later witnessed health care in other environments, I realized just how underserved those Virginia patients were. Medicine clearly appealed to me, but my father and my grandmother were practicing Christian Scientists who believed in spiritual healing, so becoming a conventional medical doctor was not a high priority in my family. I was always interested in science, academics, and research. It was at Wesleyan where I was really exposed to a large number of pre-med students, and they reoriented me to thinking seriously about medicine. My grandmother gave her blessing to my plan to go to med school, and my dad also wasn’t resistant. I met my future wife (Sylvia Gates Carlisle) at Stanford, where she was an undergrad. She had been accepted into medical school at Brown University in Providence. Brown was one of the few American medical schools willing to entertain a transfer student. Stanford has outstanding pre-clinical programs, and Brown has an outstanding clinical education program. I had the best of both worlds. Q: You ended up practicing in Watts after finishing medical school. How did that come about? A: My wife and I were fortunate to both get internal medicine residency slots in Los Angeles. I was essentially a hospitalist and chief resident in internal medicine. I was expert at admitting people and doing procedures, but I was inexperienced in outpatient medicine. After our residencies, my wife and I were assigned by the National Health Service Corps to the Watts Health Center in South Central LA. That’s where I got exposed to practicing primary care with a public health orientation, which is diametrically different from practicing in a large medical center. At Watts I was head of the urgent care clinic. I liked primary care so much that I eventually went to work full time as a primary care physician. Q: You made a dramatic switch in roles in 2000 by taking the reins at OSHPD. Why did you go in that direction? A: In LA, I got very interested in geographic variation of selective surgical procedures, and I used data from OSHPD to pursue the research. The traditional approach by the guru, John Wennberg, was to see the problem through the lens of demand variables and supply variables — things like number of beds, distance to hospitals, availability of supply services, etc. In New England, the area that Wennberg primarily used for his research, demand was driven by supply. Here in LA, I thought that there’s more to it. For my doctoral dissertation, we studied demand variables, income, insurance status, and race/ethnicity, and then we modeled zip code by procedures. Demand variables in our analysis blew away the supply variables. I was among the first to approach the problem this way, and people in urban public health weren’t surprised at all. It resonated with them. When Democratic Governor Gray Davis took office in 1999, he appointed me to head OSHPD. I ended up staying for 11 years through the administrations of Davis, Arnold Schwarzenegger (R), and Jerry Brown (D). I’m a progressive Democrat, and I worked with individuals from across the political spectrum and established a lot of friendships I maintain today. OSHPD has a budget of about $100 million a year. The agency is an overseer of hospital construction with structural engineers and architects with a special focus on seismic readiness. It is at the center of a dynamic political process that centers around the hospital industry. We negotiated policy issues in ways that weren’t confrontational. OSHPD also ran workforce policy related to degree-based health care professionals. We did things like disparities reports, outcome studies, report cards, mortality rates, and mass reporting of heart bypass surgery by surgeons with good outcomes. I think we were able to push trends on surgery outcomes, and the California mortality rate for coronary artery bypass graft surgery declined significantly. 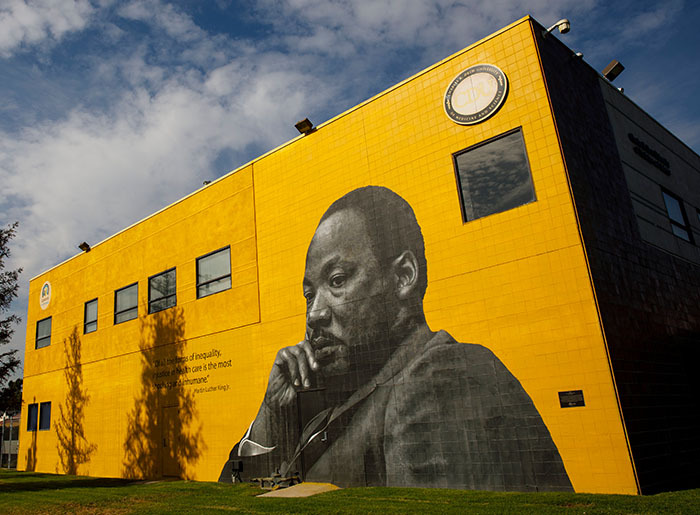 A mural of Reverend Dr. Martin Luther King Jr. graces the side of a building at the CDU Los Angeles campus. Photo: Patrick T. Fallon. Q: How does California rate among the states in the drive for policies to establish universal coverage? A: I’d say that California probably ranks third. Hawaii has had a universal health insurance program since the 1970s. Massachusetts had Romneycare in 2006. And then under Governor Schwarzenegger, California tried to establish a Massachusetts-style individual mandate. The polling was good, but the Schwarzenegger proposal failed because of the economic recession. Despite the disappointment, the California effort had profound impact. Many members of the California team joined the Obama health care reform team, so the California experience was valuable to the whole nation. Partly because of all that preparation in Sacramento, California went on to develop the country’s best state health insurance exchange, Covered California. Q: You again shifted gears in 2011 leaving the high-altitude focus of OSHPD and landing at the front lines of a campaign to shape the future health workforce. At the time, the university’s future was in doubt. A: I wanted to do what I could to help CDU survive an existential crisis. The university almost closed around 2009 and 2010. We were on academic probation, and we had less than $1 million in the bank. It would have closed if not for intervention of many people and organizations like the University of California, Bob Ross and The California Endowment, Mark Ridley-Thomas [representing the Second District on the Los Angeles County Board of Supervisors], and invaluable work of my predecessor as CDU president [and board chair] M. Roy Wilson, MD, in engineering the recovery that I joined. Now, the situation has completely turned around. CDU’s endowment today is $95 million. In the past five years we received the biggest five gifts in the school’s history. We now have a 10-year maximal university accreditation. All professionally accredited programs are in good standing. This good news ensures we can continue cultivating the culturally competent workforce that California needs. 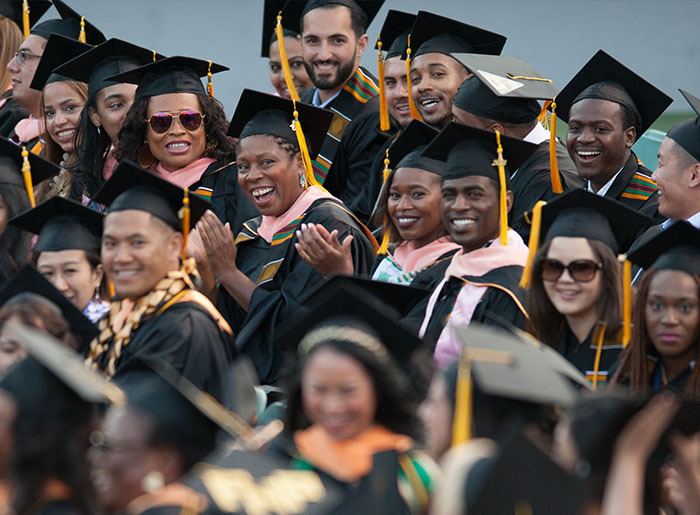 We are ranked as the nation’s second most diverse, private nonprofit four-year university. We have an opportunity to make significant contributions to the health professions. We’ve trained thousands of doctors, residents, physician assistants, and nurses, mostly from LA County and other under-resourced communities where they return when they graduate. They are often first-generation college students. They bring innate respect and compassion for their patients. They can see patients who remind them of their own mothers or grandmothers or little brothers. They are from the same community. When patients have no ability to pay, all they can say is, “Thank you, doctor.” Our trainees feel more than just satisfaction and pride from that. They feel happiness to have the privilege to do something, no matter how small, to contribute to the betterment of someone’s life. We are so proud of them, and we want to grow this university to contribute even more. CDU’s 2018 commencement exercises. Photo: Courtesy of CDU. Q: Now that you’ve joined the CHCF Board of Directors, what would you like to see the foundation accomplish? A: It’s an honor to be asked to serve in a leadership capacity with such an accomplished organization. I respect and revere CHCF’s mission, which isn’t even being pursued in states that lack similar health care foundations. I want to continue the emphasis on improving the efficiency and effectiveness of the health care system. My overriding concern is the health of the American population. On virtually any international metric of health status, the US does not occupy a rank commensurate with our expenditures on health care. Maternal mortality is high, life expectancy is low, and people can’t get the care they need. There needs to be an emphasis on developing a workforce, which CHCF backed by supporting the California Future Health Workforce Commission. It’s a challenging undertaking, and we are making progress. Today there is universal recognition of the importance of primary care. There is more appreciation of the needs of under-resourced communities, and we see growing support and involvement of people in public health and health services research. We have quite a way to go, but in all these metrics except for diversity, we’re in a better place than we were 10 or 20 years ago. We are starting to trend upward in diversity again. The tide cannot be resisted in California, and diversity in grad schools will improve proportionately. But progress won’t happen by itself. We need to be aggressive, proactive, and affirmative in pursuing diversity. Our patients need it. Q: Outside California, the state is regarded as a world unto itself with dramatically different health policies and market dynamics. What role do you think California plays on the national stage, and how does that figure into your work at CHCF? A: This state is in a fortuitous and privileged position compared to rest of the country. Because California is ambitious and visionary, the state always seems to be on the cutting edge — and that’s a wonderful place to be. Let’s build on the foundation established by the Affordable Care Act and achieve genuine universal coverage and access to care — and those can only happen through design and action.